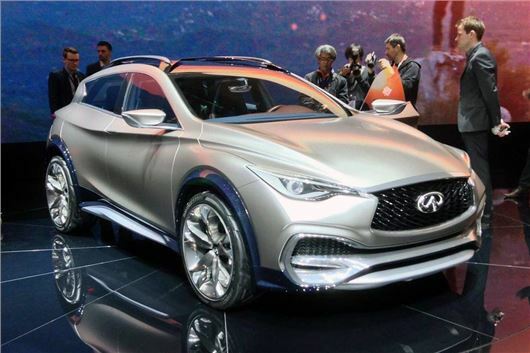 Infiniti has introduced its QX30 at the Geneva Motor Show. The compact crossover will be built on the Mercedes-Benz A-Class platform and is expected to go into production in 2016. The Infiniti QX30 Concept will be built at Nissan’s Sunderland plant and features a muscular design, with sleek coupe lines and carbon fibre cladding, which its maker claims will protect it from light scuffs and chips. The QX30 also gets large wrap around aluminium-trimmed bumpers, along with a large skid plate at the rear, which again will protect its two wave shaped bodywork from damage. However, the three spoke 21-inch wheels look less susceptible to superficial damage, with a set of low-profile tyres that will all too easily clip an unsuspecting kerb. Chances are these will be smaller on the production model, though. There’s no details about engines or economy yet, but expect the choice to consist of 2.0-litre petrol and diesel engines from Mercedes-Benz, along with one or two performance focused AMG units. The interior is described as 'clutter free', with a minimalist dash complemented by a full-size glass panoramic roof.